Discover what custom home building should be. Many home builders claim to be custom builders. Battlefield Homes made its mark in the Fredericksburg area with a simple proposition – often-claimed but seldom-true: “We are a custom home-builder.” Which means that we design homes in-house, using architectural software that allows you to visualize your home. Moving walls is just the beginning. Design features are unique for every home, and we partner with you to design and build a home that is one of a kind, truly yours. Start with one of our model plans and we’ll customize it to your liking. Or, design your home from a blank sheet of paper. Bring in your ideas, and we’ll work with you to realize them. Your lot or ours. Perkinson Homes, Inc. was founded in Richmond, Virginia in 2008 by Brian R. Perkinson. With more than 30 years of experience in the construction industry, Brian is an expert in the field. He is extremely attentive to their clients’ needs and maintains a reputation for impeccable attention to detail. They are committed to building relationships and ensuring client satisfaction in each home they build. Evergreen Homecrafters LLC is a locally based builder of custom and semi-custom homes in the Metro Richmond area. We feature homes that utilize advanced building techniques, technologies, and design to deliver a high performance, energy efficient homes to our customers. Evergreen Homecrafters LLC is led by Jon Anderson. Jon grew up in the residential construction industry as his Father and Grandfather successfully built quality homes and supplied the residential construction industry for many years. After serving as an Officer in the U.S. Air Force, and working for a period with Procter & Gamble, Jon had the fortunate opportunity to once again return to his natural passion… building homes. At Evergreen Homecrafters LLC we are committed to building beautiful, high quality homes with floor plans that match today’s lifestyles, are energy and resource efficient, and are environmentally friendly. The result of our commitment is that our homeowners enjoy a more comfortable home that is both easier to maintain, and costs much less to operate each and every month. Providing new construction, renovations, remodels, additions and carpentry to Charlottesville, Virginia for over 35 years. 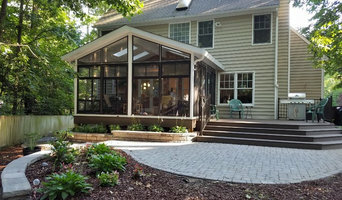 Sun Structures experience in the construction services make them the best choice for new construction, additions, renovations, remodels and carpentry in Charlottesville, Virginia. Taking pride in the quality craftsmanship provided to customers, Sun Structures provides attention to detail throughout the entire building process. *Authorized Waypoint Living Spaces Dealer* James River Construction was established in 1995, built upon a foundation of honesty, integrity and discerning craftsmanship. We’re a premier residential contracting firm for the Richmond metropolitan area, and a preferred choice for building custom homes, additions and renovations. We also provide many other resources related to the construction process, including architectural design, consulting and project management. At James River Construction, we understand that building better spaces is essential to living better—and that the cornerstone to every effective space starts with you. That’s why company president Ken Felts has assembled a group of key individuals who are dedicated to unparalleled quality, supported by an experienced team of expert designers, subcontractors and vendors. This ensures that our clients are treated with the level of service, professionalism and quality craftsmanship that they expect when investing in their homes. As a Certified Green Professional, James River Construction is interested in using sustainable, energy efficient and environmentally friendly products. HIVEX Basement Finishing Co., formerly Dee Bee Home Improvements, specializes in complete basement finishing. Finishing your basement is an excellent way to dramatically expand your living space as well as increase the value of your home. HIVEX specializes in transforming your home into its full potential and at a great value. With over 40 years of experience, company owner Dan Betts was voted a legend in the home improvement industry. In recognition of our quality craftsmanship and attention to detail, we have received numerous prestigious awards and honors. Our team of professionals is dedicated to uphold our reputation of professional workmanship, honesty, and integrity. We have recently changed our look and name to reflect that we exclusively specialize in basement finishing. As HIVEX we're the same team doing the same top quality work! Our basement finishing specialists take pride in transforming homeowners needs and dreams into reality! General, or construction contractors, are often known as project managers. They oversee the entire remodeling or new home construction project and facilitate all day-to-day tasks that move it toward completion. A Montpelier general building contractor will work with your architect to review plan as you build a house and ensure everything is in place before work is started as well as arrange for permits and necessary inspections. While good local home improvement contractors in Montpelier will have the skills to handle certain tasks onsite, such as carpentry, he or she is also responsible for hiring subcontractors for the majority of jobs, such as electrical work, painting or plumbing. In addition, the general contractor should be on-site regularly to inspect the progress and resolve issues. Here are some related professionals and vendors to complement the work of general contractors: Architects & Building Designers, Interior Designers & Decorators, Landscape Architects & Landscape Designers, Kitchen & Bath Designers, Specialty Contractors. Home remodeling contractors are a must for successful completion of a renovation. Because of this, it's essential that you do your homework before deciding on the right general contractor in Montpelier as you remodel or build a house. Inspect bids carefully. Was it ready when the contractor promised it? Was the bid for building a home unusually high or low? Each of these things can be very telling: A late bid may reflect timing standards, and an off-the-mark bid could be code for a pricey premium or a deliberate underbid to score the remodeling job. You should call references, carefully read reviews and visit completed projects in Montpelier, VA to see if they’re what you expect for your job. Once you do secure your local Montpelier contractors, read the contract very carefully to be sure everyone is on the same page. Find a Montpelier contractor on Houzz. Narrow your search in the Professionals section of the website to Montpelier, VA home contractors. You can also search for photos in Montpelier, VA and contact the Montpelier general contractor who worked on the project.